Ever since I baked my first red velvet cupcakes using the recipe from the book, The Hummingbird Cookbook by Tarek Malouf at here, my son and I started loving anything that is red velvet instantly!!! It's like there is no turning back for us after we have tasted the true essence of red velvet. Why red velvet? Isn't it just food with red food colouring? NO NO NO!!! 1) acidic vinegar and buttermilk to bring out the red anthocyanin in cocoa preferably non-Dutch-processed. If you are using Dutch processed cocoa powder, please add extra vinegar. 2) alkaline baking soda to react with the acidic vinegar and buttermilk in order to create a light, velvety and fluffy texture. 3) red food colouring to make the food traditionally red or red-brown or mahogany. 4) THE CREAM CHEESE frosting! YUM!!! Why are these red velvet waffles so special? 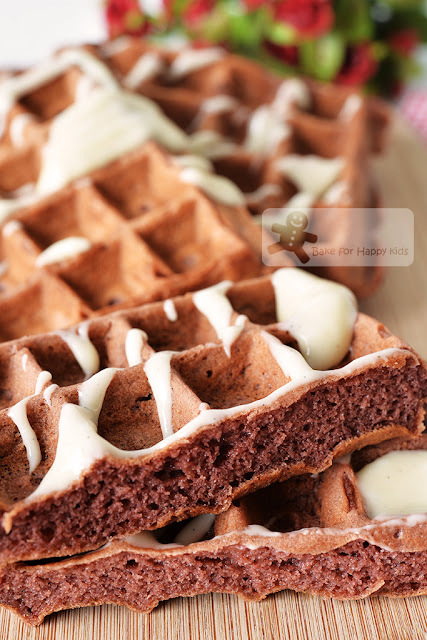 Unlike many crispy waffles that I have made at here, here, here, here, here, here and here, these red velvet waffles are EXTRA SPONGY FLUFFY with cake-like texture in their inside and have a good amount of crisp on the edges. 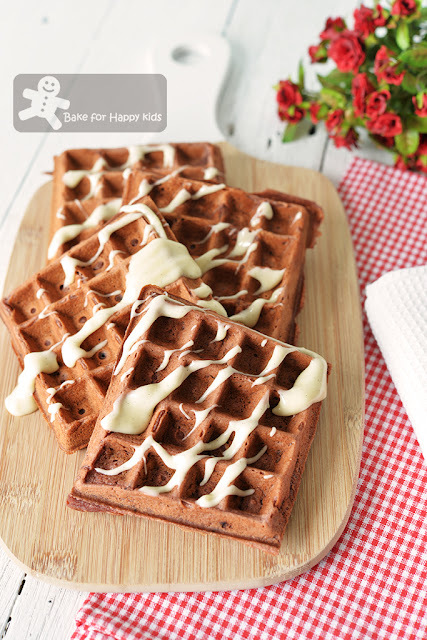 These waffles are mild in their sweetness and compliment extremely well with lightly sweetened creamy cream cheese vanilla drizzle. They are so so so yummy!!! 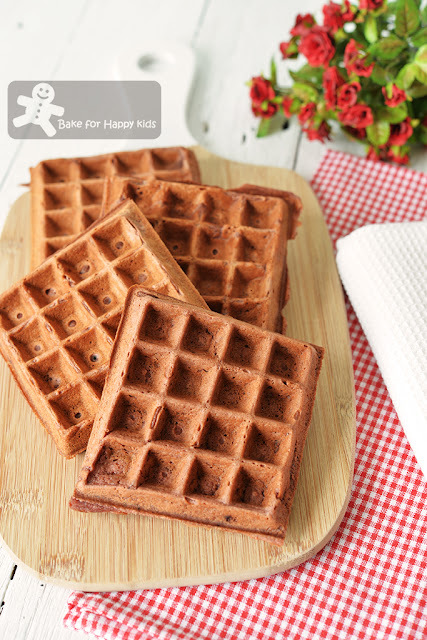 With just one bite... my son and I love these red velvet waffles instantly!!! These waffles are extra fluffy with a good amount of crisp! ... but they are not completed yet. They need cream cheese drizzle to be perfectly yummy!!! There you go... Spongy. Fluffy. Crispy rims. Creamy. Sweet. Simply heavenly!!! With a good amount of cream cheese drizzle, this is exactly what a perfect red velvet should be! It's very easy to cook these heavenly waffles and I'm sure everyone with a waffle iron can do it too!!! All you have to do is just mix the ingredients and cook! Just within minutes, you can enjoy these yummy waffles at home... So so so easy!!! Interested? Here's a video showing how I cooked these waffles. Thanks Bensound for the music in my video. It's Valentine's day soon... So why not make these easy yummy waffles to impress your lover? LOL! So, what's next? Red velvet chiffon cake? Red velvet scones? Red velvet Swiss roll? Red velvet banana bread? Red velvet yeasted bread? Red velvet cheesecake? Red velvet ice cream? Red velvet fudge? Red velvet donuts? Hmmm... I don't think I'm the only one who has been imaginative and I'm pretty sure that we can find these creative recipes everywhere. Here's the recipe that is modified from Food Network. * This is one quarter of the original amount and the sweetness and it is just right for us. Please feel free to make double or even 4 times of this amount if you like your waffles to be generously served with this drizzle. Combine all dry ingredients. Set aside. In a large mixing bowl, whisk all wet ingredients until combined. It's ok if the mixture is lumpy with clumps of butter. Add dry ingredients into the wet ingredients and use a fork to whisk gently until just incorporated. Do not over-mix and it's ok if there is lumps in the batter. Cover batter with plastic wrap or a tight-fitting lid and allow it let rest at room temperature for about 10 mins. Spray preheated waffle iron with vegetable oil spray. Caution: If you are cooking waffles on the your stove, please do not spray cooking oil into direct fire! Pour adequate waffle batter (about 1/3 to 1/2 cup depending on the size of your iron), close the waffle iron and flip immediately. Cook each side for about 3-4 mins or until both sides are crispy and golden. Remove waffles out from the iron and repeat cooking with the remaining batter. While the waffles are cooking, mix cream cheese and icing sugar until smooth and combined. Add vanilla and milk and beat until mixture is smooth with dribbly thick consistency. Mix in a little more milk if required. Set aside. Cover with plastic wrap if necessary. Enjoy these fluffy and crisp waffles on the same day when they are freshly made. Serve immediately with cream cheese drizzles or keep warm in a 100°C or 200°F oven until ready to serve. Although these waffles are pretty structurally stable, they are not suitable to be kept in a freezer or even for the next day at room temperature because their optimal fluffy texture will deteriorate tremendously when they are not consumed within the same day.